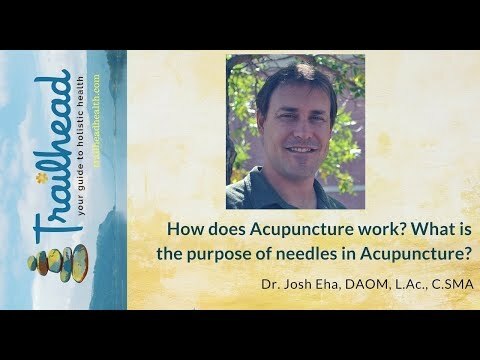 What is the role of Acupuncture needles in Acupuncture? If somebody is very fearful of needles because that’s one of the first things and the most commonly asked question on the web about acupuncture needles. Can you explain to someone who was afraid of needles, you know why acupuncture relies on needles what’s the point and why it’s an essential part of the treatment but maybe why not fear it? Yeah, that’s a good question. Boel Acupuncture uses needles to coerce the nervous system to be in harmony with itself there’s a lot of competing vibrations and effects that the body sends back to the brain, concerning the stimulation, and when those aren’t working together, we have dis-integration or dis-ease in the body. What the acupuncture needle does, is put a very talented musician next to somebody who is not doing their job appropriately, in order to show them how to stay in rhythm, how to stay in tune, and the body naturally melts that information into homeostasis; which is the body’s natural way of balancing itself, right? When we get hot, we cool off when we get dry we moisten, when we get empty, we fill up. That’s all very natural, and that’s happening all the time when that falls apart it’s because of a lack of communication; and that communication is being shown through evidence with patients, even on lab animals that the brain reconnects things that are disconnected with acupuncture. The needles are needed because stimulation of the nervous system is how the body changes habits from what kind of works a little bit, to what’s optimal. The stimulation that I give is not sharp, stabbing, I’m drawing blood, or getting a vaccine type needle. Our needles are as thick as human hair and no thicker. Our needles in the hands of an expert practitioner will move through the skin quickly and not cause that sensation, and when it reaches the target then there is a sense of peace and calm, the endorphins kick in, almost like a message. There is a spreading and a quieting, in a relaxing sensation and the grand majority of my patients find it very comforting and positive as an experience not just in effect. Rheumatoid Arthritis – What Symptoms and How to Treat. Rheumatoid arthritis is an autoimmune disease that causes symptoms of pain, redness and swelling in the affected joints, plus stiffness and difficulty moving these joints wake up for at least 1 hour. The rheumatoid arthritis treatment is supervised by the rheumatologist and includes the use of drugs, diet, and physiotherapy, which relieve pain and improve quality of life. But it has no cure and treatment must be done for a lifetime. Symptoms of rheumatoid arthritis. The first symptoms usually include fever, fatigue, joint pain, the malaise that may occur and disappear without great conspiracy or explanation. Usually, it appears weeks or months before the classic symptoms look like stiffness and pain and redness in the joints. If you think you may have rheumatoid arthritis, what you feel: 1. Pain in the joints symmetrically (on both sides of the body). 2. Swelling and redness in one or more joints. 3. Difficult to move the joint. 4. Reduced force on the relevant field joints. 5. Joint pain that is worse after you wake up. All of these symptoms appear in the affected joint but rheumatoid arthritis may end Generate others like back pain due to poor posture, and with the development of the disease, other joints such as knees, shoulders, and cervical can also be affected. Women are more affected, and symptoms can start around the age of 30, although it is more generally, starting from 40. How to confirm the diagnosis. Observation symptoms and tests can diagnose rheumatoid arthritis, but it can be challenging to diagnose, especially at the early stage when signs are not very clear and can be confused with osteoarthritis or other diseases. So, to confirm the rheumatologist can ask for several tests such as: How to confirm the diagnosis. Observation symptoms and tests can diagnose rheumatoid arthritis, but it can be challenging to diagnose, especially at the early stage when symptoms are not very clear and can be confused with osteoarthritis or other diseases. So, to confirm the rheumatologist can ask for several tests such as: Blood test with rheumatoid factor, which is one that can indicate that disease, though In some cases the result is a false negative; Antinuclear antibodies; X-ray of the joint to determine whether there are osteoarthritis, is especially asked when there is are arthritis symptoms in the hands or feet; Magnetic resonance imaging, when there is suspicion of arthritis in the spine; Level of C-reactive protein, around the intensity of inflammation; Calculated tomography around the range of inflammation. In this disease, the body’s defense system begins to have a healthy joint attack, but it is not yet known exactly why it happens. Although the causes of rheumatoid arthritis are not fully understood, some factors that affect its development are a viral infection, bacteria, genetic factor, traumatism and smoking increase the risk of developing the disease. Treatment for rheumatoid arthritis. Treatment for rheumatoid arthritis is usually started with anti-inflammatory drugs, corticosteroids injections and immunosuppressive medicine, which can be used in times of crisis as well out of the crisis. Also noteworthy is: Physiotherapy, especially in times of crisis, when there are intense pain and inflammation; Accept a diet rich in anti-inflammatory foods such as tuna, salmon, garlic or orange; Stretch during the day; Apply hot water bags over the joint; Practice light or moderate exercise in periods outside the crisis, such as water aerobics and pilates avoid strenuous exercises. Physiotherapy is an essential treatment for rheumatoid arthritis and includes the use of mobile phones, hot purses, exercises, joint mobilization techniques and reinforcement of the affected muscles, helps prevent malformations and to improve daily movement of the person. In the latter case, when the joint is severely compromised, and nothing looks like the symptoms, the doctor may suggest surgery to repair the tendons, replace the joints, remove the excess synovial membrane, or join two bones so that there is no longer joint, as It may be useful, because of example. 30 to 40 years is the peak age where people develop psoriatic arthritis, which is about a decade later than the peak age for psoriasis, for the skin disease. People usually take 10 to 20 years to develop psoriatic arthritis. In terms of the disease course, it’s somewhat unpredictable. People will experience episodes of worsening of the psoriatic arthritis and then episodes of improvement. 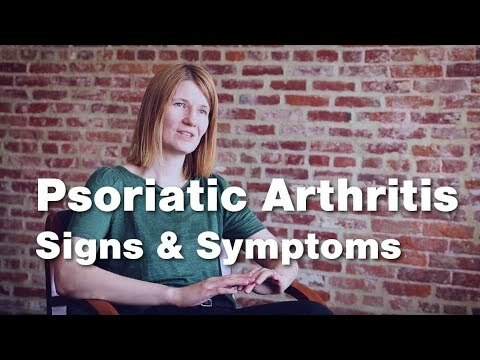 Early symptoms with psoriatic arthritis are important. For example, in the Toronto cohort, it was shown that people who developed psoriatic arthritis the year before they were diagnosed had reported joint pain, fatigue, and stiffness. So, again, the symptoms, although they may seem non-specific, are very important and maybe the initial steps that patients experience even before they are diagnosed. Psoriasis is a relatively common skin disease. It affects about 4% of Americans. And the form that is most associated with psoriatic arthritis is psoriasis that’s located on the scalp. Having psoriasis behind the ear or inside the ear also counts. Perianal psoriasis. And then of course there’s the more frequent form where classic psoriasis is localized on the knees and on the elbows. It’s very bothersome for patients, and there’s degrees of this. And then the most classic form is what we call plaque psoriasis where people will develop these raised lesions. There’s a rash that’s called guttate psoriasis, which looks like little drops of rain. That’s how it got its name. It’s just tiny patches of rash, but it’s spread over almost the entire body, so if you add these patches together, it’s a lot. It’s just that they are scattered all over. People tend to get this more often after strep throat. It’s most common in young people. That’s one form, in addition to the classic plaque psoriasis. There’s one that’s called inverse psoriasis, where people tend to develop the rash in the skin folds. It tends to look different just because the skin in those areas has a different quality. It’s not going to scale as much, but it’s going to be red, and it’s going to hurt, and it’s going to ooze fluid, and it’s very uncomfortable. Then there are more rare forms. About two to four percent of people with psoriasis will have a rash that’s called pustular psoriasis. It looks like little pimples on the hands or the soles of the feet. Of course, these are, again, itchy and tender. These pimples are sterile. There are no bacteria in it, so it’s not a real pimple. It’s just inflammation, but it looks like that. We see this in people with psoriatic arthritis as well. Then, of course, there are more severe systemic forms where most of the skin, 80% to 90% of the surface is affected by a red rash. We call that erythroderma. When that is severe, that sometimes needs hospitalization and treatment with health and drugs to try and get the skin under control. Because if you think the skin is our largest organ, and it’s essential for the body to function properly and to be protected from everything else around you. Nail psoriasis can look in many different ways. The most common form is what we call nail pitting. There are small pits on the surface of the pin and, again, that can have different degrees of severity, from just a few holes on several nails to really, all the entire nail surface being changed by that. Then, the extreme form of pitting would be nail plate crumbling, where the nail can turn into a powder and then it’s just disintegrating. Another form is what we call onycholysis when the nail lifts off the nail bed. The nails grow slowly, so even with treatment, it takes months for the nail to recover fully. But it’s reversible with effective treatment. (gentle music). The inflammation stops as it starts to go away. Many times people with psoriasis will have back problems because the same waste that’s building the cells that are building on their skin our cellular waste in the body that the body has to deal with. Plus the body is sending fibrin into those areas to try and heal it. So then were having accelerated cellular waste and fibrin deposition. So we want to be able to clean this stuff up by making the body more alkaline is key and we do that by eating more alkaline diet eating more fish, omega-3 is a very good for the skin. We want to limit alcohol, caffeine, red meat and wheat. Some research even says eat whole wheat, no to me whole wheat is still acid-forming we want to stay away from caffeine, coffee, again wheat and red meat. It’s not forever it’s really just until you get control of your issues. You’ll see your life will change. So again it’s important to start thinking about your lymphatic system and in psoriasis we never hear it mentioned. So there’s a system that must clean our skin, especially the superficial lymphatic system which is dependent on breathing. So what do you do? You know you come to JohnOssipinsky.com we recently just changed the name to OssipinskyHealthAcademy.com. I do coaching for people around the world and it makes a great change. I mean these people are desperate they don’t know what’s going on with them. Once I explain and show them pictures of the lymphatic system and explain simple things they can do they feel relief they have hope. That’s one thing I give people a lot of his hope one day understand the lymphatic system. So if you’re in the Phoenix area please give me a call because I do a fully closed session but I will activate your lymphatic system, teach you how to activate your lymphatic system and you read my book. Or during my coaching I don’t just work on your body I actually talk to you and see what you’re doing in your life and teach your little tricks that I’ve learned over 22 years of having to manage my life and my lymphatic system. Because it’s not about being perfect, I’m not that type of person. I’m not a vague and I’m not a vegetarian. I want to live my life but I understand the value of vegetables. All the research I put out on my facebook page and twitter from other researchers is really about how, you know, a healthier diet. Fruits and vegetables can really forestall a lot of the diseases that we have and can help you have a healthier better life. But the thing is most fruits and vegetables are alkaline and make our lymphatic system flow and when our body flows, when our organs flow, when our skin flows, then we do much better. We have complete circulation. So again if i can help you understand how to get rid of your psoriasis, no matter where you may live but if you’re in Phoenix your lucky come see me. But just one hour of talking with me, if you do decide on doing coaching, you will see a dramatic difference. It’s not so much about eating a perfect diet for a while. It’s more about knowing that we have to clean up first bit for a specific amount of time. Then you can go back to a normal diet for a few, you know days or weeks, and we go back into another cleansing. It’s really about learning how to clean on an everyday basis and then our health problems really just go away. If I can help you, contact me at ossipinskyhealthacademy.com and I’ll gladly help you understand the lymphatic system and its role in psoriasis. Thanks. We’re going to talk about psoriasis. This is something that I see a lot in my office dealing with the lymphatic system. People come to me for that, but not only psoriasis it could be eczema and children you see that a lot and when we look at skin problems it really is a clear sign that the lymphatic system is having a problem and let me explain that the lymphatic system has really different levels there’s a superficial lymphatic system and a more in-depth lymphatic system the superficial lymphatic system is right under your skin. So if you were to touch your skin very gently without really indenting it, that’s your superficial lymphatic system. It’s everywhere, and it’s a narrow river that must move through your axilla nodes up to your neck and ask go through your abdominal nodes if it’s down in your legs. So it is a river that has to remove fluid, fibrin, parts of dead cells, hormones, triglycerides, really the waste that’s in our body that can’t get into our veins. So when we ignore this system that’s meant to clean us. We sort of fill with dead cell material, and that’s what’s happening in psoriasis, and you’ll see that it’s not just skin issues. Most people with psoriasis will have problems with other immune problems they’ll have possibly lymphomas they’ll have Crohn’s disease more digestive issues, and they even have more cardiovascular problems and even depression, and to me all of these problems can indeed be related to the lymphatic system not functioning optimally and we’re filling with cellular waste. Wherever that cellular waste builds, we have problems. So again if it’s in our superficial lymph system that is where we get our skin problems. So our superficial lymph system is only dependent on breathing. So when we take a deep breath and let it out a little force, we’re pulling lymph fluid and venous fluid through our tissues. But if you’ve looked around, I do this with all my lectures and classes, people really don’t breathe, and if we’re in pain we breathe minimal we sort of slouch and we just you know we’re not feeling well. But we have to learn that we’re in control of our lymph system and by merely breathing more we can help our skin, but of course, it’s much more than that, right. We’re filling with cellular waste so we have to learn ways to open up our tissues and we do that by balancing pH in our body. Because when we’re acidic and remember, we spend 50 billion dollars on antacids and Prilosec so we know there’s an acid problem. But when we become slightly acidic, our lymphatic system constricts and can no longer clean as it should be. So we slowly filled with cellular waste and that’s why diseases like psoriasis develop and get worse, but there’s hope! When you understand the lymphatic system, when you know how to maintain and detox your lymphatic system, you’ll be putting a step into whatever you are already doing because you probably become the expert. So most people become try everything which is great, but we have to work the lymphatic system. So you want to do a lymphatic therapy often I see a difference in clients from the first session of opening their lymphatic system.